Yesterday I went to a talk at UCL. The evening was a “beer and pizza science evening” led by the UCL Genetics Institute in population genetics. Anyone with some sort of knowledge in this field would also realise that the beer and pizza would bring in a crowd despite the amount of not so popular statistics and modelling that can be involved. This was very true as the large gathering of people to the event somewhat dwindled after the half-time break. I however did stay until the end and was pleasantly surprised both at my ability to understand the talks and the actual content. Here I’ll summarise each one and give my own take on the topics. Prof Mark Jobling was first and spoke about Y chromosome analysis. The Y chromosome is the smallest of the bunch and is somewhat neglected in sequencing projects and medical genetics. It is present in just males and in many instances it isn’t even included in higher organism genome releases purely because the subject chosen is female as this gives the added benefit of twice the amount of X chromosome for your money. However the potential in this little guy shouldn’t be underestimated. 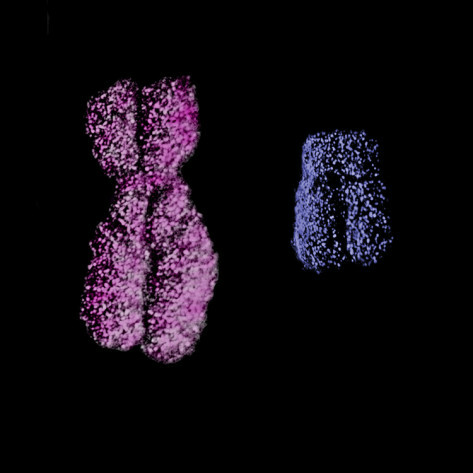 The X chromosome next to the somewhat puny Y chromosome: small and mighty? The Y chromosome itself actually has very little sequence diversity and through custom sequencing of just this chromosome it is possible to map all the chunks of DNA across it and where they come from. The contents of these chunks and order of variation inside them can be called the haplotype. 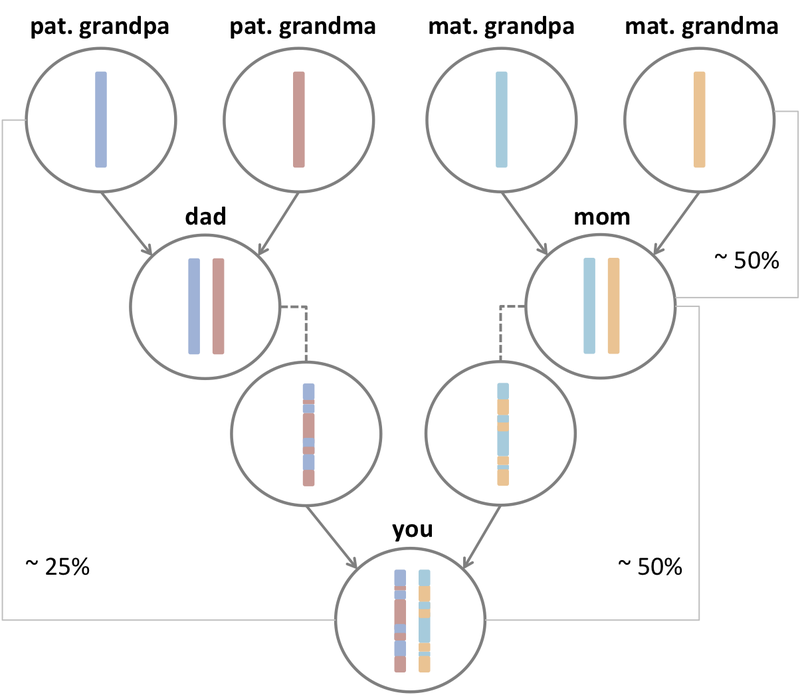 The novelty of comparing haplotypes across the Y chromosome with inherited surname shows that many men who think they are unrelated (despite actually having the same surname) are in fact descendants of common ancestors. 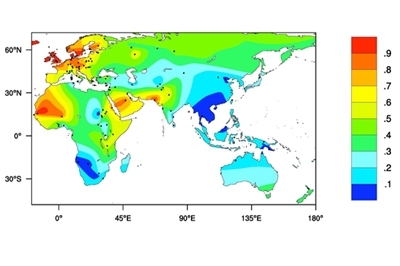 In fact, a relatively rare version of the Y chromosome is common in almost all ‘Attenborough’ men that were sequenced! The idea behind all of this is that the Y chromosome appears to be under some strong purifying selection, although what that exactly is we can only guess (but most people believe it is some sexual/social advantage i.e. successful men have successful sons who have successful sons etc.). The personal gain from this talk was the confirmation that the methods behind this sequencing are very similar to mine and they are facing very similar problems to me. Woohoo, I am not alone! Dr Daniel Lawson was the first speaker after the beer and pizza break so had a smaller audience to contend with. The talk was a lot more maths/statistics/programming/algorithm stuff that often goes over my head but at least I understood the reasoning behind the concept. I often talk about sequencing and whole genomes but what can be difficult to comprehend is the enormity of this data. The total length of the human genome is over 3 billion base pairs, now multiply that by however many people you are sequencing and your computer can get really slow! Now the genome can supposedly be sequenced in its entirety for $1000 we are going to get a lot more data, but how do we handle this? The current algorithms and models can’t be scaled up easily as the estimates of important parameters actually get worse with more data! We have to look for analytics rather than models to generate our data. Now the rest of the talk was describing the specific algorithm Dr Lawson has been working on which seems to iteratively select a samples to estimate off of but I’d be lying if I said I understood any more. I have a lot of reading to go and do! Prof Mark Thomas was the final speaker and he works on detecting signals of recent selection using ancient DNA data. Again, I’d like to brush over the statistics and modelling and talk more about the applications and ideas. 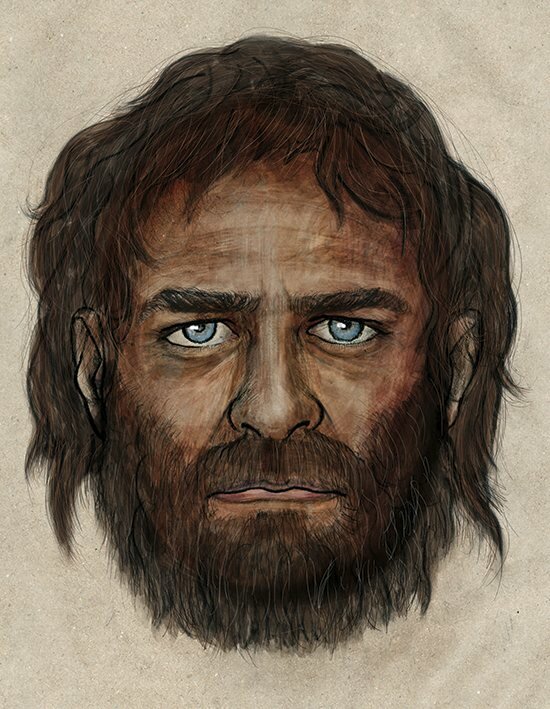 There are a few aspects of modern humans that have so obviously been strongly selected for. A key one is lactase persistence – the ability to digest lactose from milk. It is a western thing really and you may even know many East Asian descendants who are lactose intolerant. Oddly enough there are many known (and unknown) mutations that lead to the persistence of the enzyme lactase into adulthood. This shows convergent evolution: different pathways have led to the same outcome. The benefit of being able to drink milk and eat dairy was, at some point in the past, so strong in Western Europe that people who couldn’t effectively died out! The map below shows lactase persistence (people who can digest lactose in adulthood) in red and lactose intolerance in blue. Find the story in the guardian here. Very enlightening, I had no idea that the prevalence of lactose intolerance was higher outside of the western world. So thanks! No problem, I’m glad you found it interesting!